Is there anything more romantic than riding the train in India? From the early morning cries of the chai wallahs to the breathtaking scenery to being fed by a Marwari family, this is, truly, incredible India. And booking tickets online on Bharatiya Rail has never been easier. Until a couple of years ago, IRCTC's chaotic website was the only option. But now there's a much better alternative: cleartrip.com. Apart from the much cleaner design and a very fast and intuitive user-interface, cleartrip.com accepts international credit cards, which IRCTC does not. cleartrip also offers airline and hotel bookings. 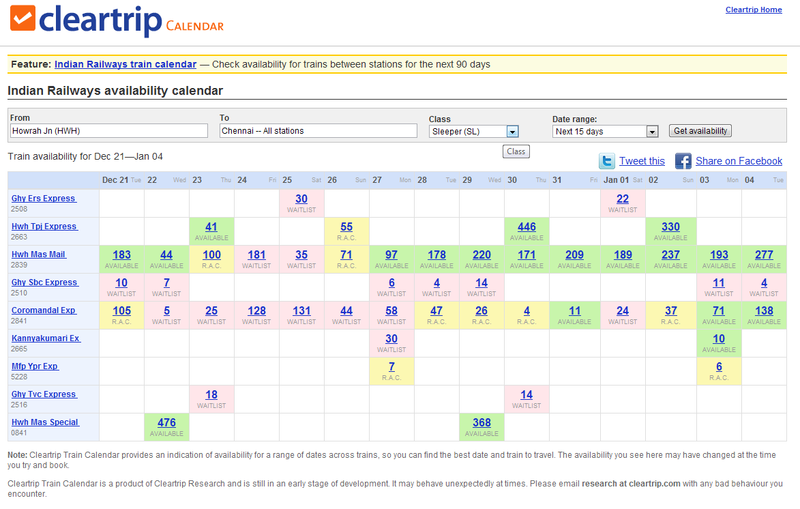 Another neat feature of cleartrip is its always-in-beta Indian Railways availability calendar. Just enter any two stations, the desired class, and a date range, and cleartrip will quickly display a color-coded availability matrix.